Curb tape seals roof mounted air conditioning units against water, dust and other environmental irritants. Contractor-grade roof curb tape prevents rain, dirt and moisture from damaging sensitive electronic parts. Curb tape comes on a convenient release liner for easy application by hand or with a roller. Simply peel and stick for all AC installations, repairs and replacements. Curb tape is supplied in rolls cut to your specific width and thickness with a single sided adhesive on easy-to-peel release liner. Flexible neoprene rubber or vinyl nitrile roof curb tape conforms to irregular roof surfaces for convenient application and superb sealing quality. 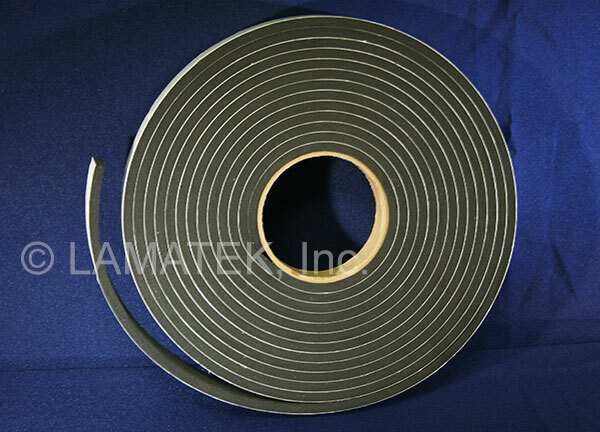 Curb tape is supplied with an aggressive rubber-based adhesive on one side that bonds quickly to maximize productivity. Available in a variety of densities from soft to firm. LAMATEK’s neoprene curb tapes are UL 94 HF-1 rated for flammability. Neoprene is a flame retardant blend made from elastomeric rubber sponge. Contact our market specialists for technical data sheets and to request a quote today.